Parking is available to be purchased for those taking the GA Ferry. In an effort to reduce plastic waste and encourage attendees to protect the planet, Ultra introduces the “Bottle Wall”. This art installation’s motto is simple: make art, not trash. Participate in this interactive art installation by disposing of your water bottles in the structure and watch it come to life as it illuminates at night. For those traveling from West Palm Beach and Fort Lauderdale, we recommend taking the Brightline to Miami. This luxurious and comfortable transit experience features WiFi, power and USB stations as well as food/drink for purchase. Within walking distance of Wilkie D. Ferguson, Jr. Metromover Station and Government Center Metrorail Station. The final Brightline train will be departing Miami at 3:30am EDT on Friday & Saturday and 3:10am EDT on Sunday. Use the promo code GOSMART while booking your ride and receive 25% off the SMART train option. As you enter Ultra 2019, you will be immersed within a detailed floor mural painted by the Chilean visual artist, Dasic. Ultra Music Festival welcomes the “Eco Village” back for the 14th consecutive year! This area of the festival hosts multiple interactive booths featuring activations from the world’s most influential nonprofit organizations. Working closely with the “Mission: Home” environmental campaign, the Eco Village will provide a brand-new experience at Historic Virginia Key Beach Park. Entrance for those taking a GA Ferry. All routes, times, available amenities and other transportation details are subject to change without advance notice. Located next to the Hard Rock Cafe. You must bring a copy of your confirmation email, an acceptable form of identification for entry to the event and the credit card used to purchase your wristband(s). Without these items, you may be denied your wristband(s). Stay hydrated at this free water station. The Mexico/Miami based visual artists known as System_3 are building on their 2018 Ultra debut by unveiling a brand new installation. Hypercross is a 20-foot tall geometric masterpiece, created with scaffolding and 36 programmable LED lights. In 2018, the Mexico/Miami based artists known as System_3 made their Ultra debut unveiling the captivating art installation, VOIID (as seen below). This year, the talented visual artists return to Ultra to introduce the second installment of their 3D light experiment, now known as Hypergate. Parking is available to be purchased for those taking the VIP Boat. A massive painting comes together right in front of your very eyes in this live art experience. A painting comes together on this enormous canvas right in front of your very eyes. Keep yourself light on your feet by using one of our lockers to stow away your personal belongings. Beginning this year we will be providing safe, secure and easy storage with all-day access so you can come and go to your locker, and your valuables, at any time. Each locker will have access to a mobile charging pack with cords that you can use to charge your devices throughout the duration of your rental period. You may take this charging pack with you when roaming the festival. Once the mobile charging pack is out of battery, simply exchange it for a fresh one at the locker reservation table. When you reserve a locker online, you will receive an email 24 hours before the festival containing your locker location, locker number, and lock combination so you can easily find and use your locker. Reserve your festival locker in advance to avoid waiting at the festival! Take a relaxing break from the house and techno beats of RESISTANCE Island at Lost Creations. 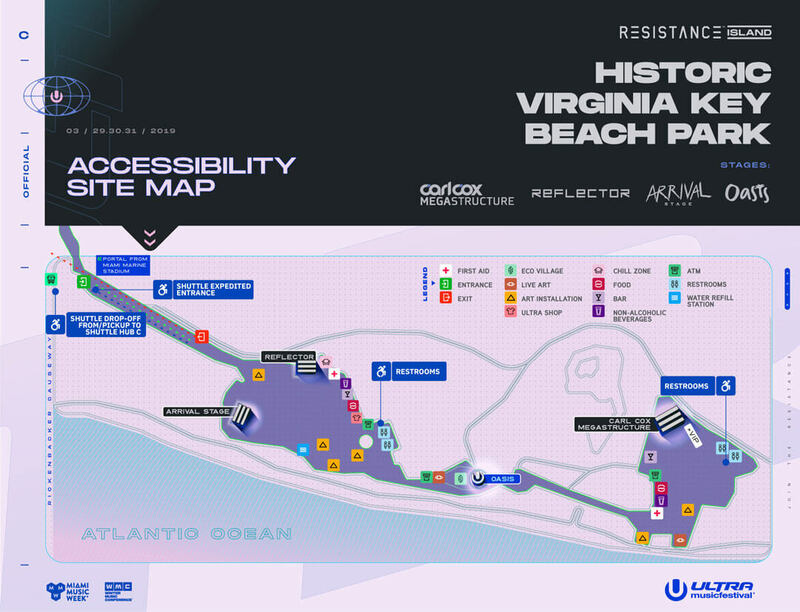 This immersive, experimental and environmentally friendly lounge makes its Ultra debut this year on Historic Virginia Key Beach Park. 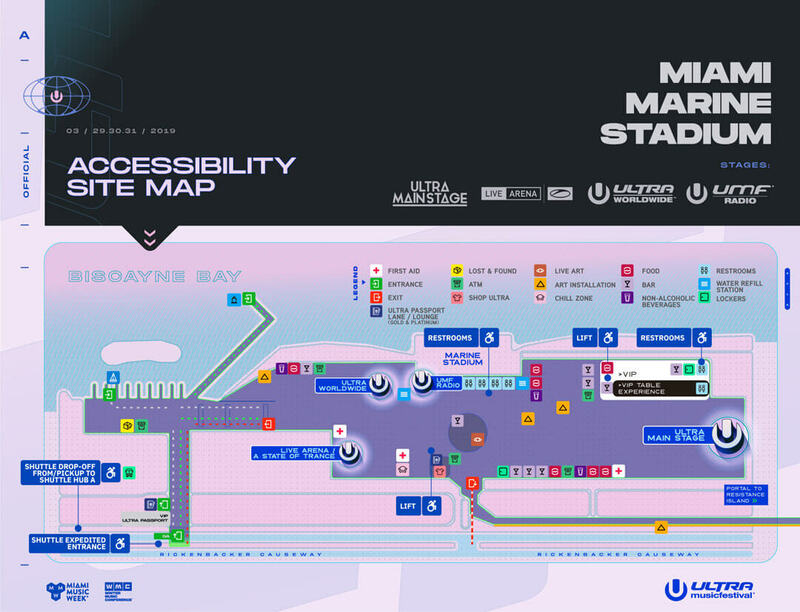 Entrance for those taking official shuttle transit to Miami Marine Stadium. Enter RESISTANCE Island by passing the “Mirror Sphere” art installation. These giant, 26-foot organic sculptures also serve as chrome mirrors! While walking through RESISTANCE Garden, enjoy the enormous LED art installation known as Mushroom Row! Entrance for those taking official shuttle transit to RESISTANCE Island. Shop the latest Ultra and RESISTANCE gear featuring hats, T-shirts, fans and much more! Take a breather from the madness and shop the latest Ultra gear featuring everything from hats to T-shirts and lanyards to sunglasses. Located at Shuttle Hub A: Arts & Entertainment District (Arsht Center Station). Located adjacent to the Adrienne Arsht Center Metromover Station. Journey to the Carl Cox MegaStructure by way of 2 large-scale LED tunnels. “Ultra Hive” will feature the return of the emblematic U, dressed in a coat of flowers. Take a break from the action by relaxing in this beautifully crafted art installation. As you enter Ultra 2019, there’s no better place to take a photo than in front of this giant Ultra letter sculpture. 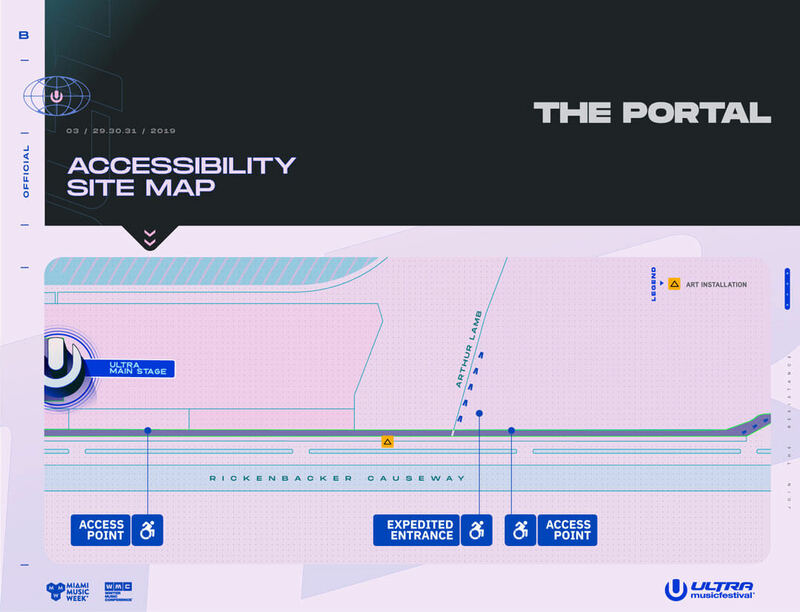 An expedited entry lane for Ultra Passport holders with Gold and Platinum status. A dedicated area to enjoy amenities, available exclusively to those with Ultra Passport Gold and Platinum status. Entrance for those taking a VIP Boat. Located at the Intercontinental Hotel. VIP ticket purchasers will receive FREE dedicated, VIP-only boat service as the exclusive mode of transportation to and from the festival. Parking available to be purchased at Intercontinental Hotel Valet.